A halt to fighting does not necessarily end a conflict, the top United Nations political official told the Security Council today, detailing ways in which the Organization is taking a more systematic approach to reconciliation, particularly in the aftermath of conflicts within States. “As we have seen repeatedly, fighting that ends without reconciliation – especially fighting inside States – is fighting that can, and often does, resume,” said Under-Secretary-General for Political Affairs Jeffrey Feltman. His remarks echoed those of Prince Zeid Ra’ad Zeid Al-Hussein, Ambassador of Jordan, which holds the Council’s rotating presidency for the month and whose delegation issued a concept paper ahead of the debate. He stressed that what the UN has achieved in maintaining international peace and security has been mainly physical: the separation of warring parties; mediation between them; the training of police personnel; and the provision of assistance in rebuilding destroyed infrastructure, among other achievements. “What the United Nations has not understood well enough is how it can help forge a deeper reconciliation among ex-combatants and their peoples based on an agreed or shared narrative, a shared memory, of a troubled past. This is especially relevant to sectarian, or ethnic, conflicts, as well as wars driven by extreme nationalism or ideologies,” he says in the paper. In his remarks, Mr. Feltman noted that while the UN is constantly reviewing its approach to enabling permanent peace, there are four areas that deserve special attention, including specifying reconciliation principles and mechanisms in peace agreements, and carefully timing elections and constitutional review processes. He stressed that reconciliation, which can be encouraged and enabled by the international community, has to come from internal processes, and noted the importance of establishing a UN repository of comparative knowledge and experience on reconciliation. The responsibility for reconciliation rests with national actors, as well as assistance from the international community, he added. “Leaders need to set the example, not just in ceasing war-time rhetoric and ending the intentional promotion of grievances, but also by deeds of genuine cooperation and honest examinations of their own roles in conflict,” Mr. Feltman said. Turning to the role of youth, who often grow up in post-war conflicts to be more extreme than their parents, he stressed the importance of working with parents and teachers to develop early a history curriculum that share different interpretations of conflicts. “This could form the beginning of developing a shared narrative and establishing points of convergence in people’s experiences and thinking,” Mr. Feltman said. He highlighted the conflicts in the Central African Republic (CAR), South Sudan and Syria, where the urgently-needed physical end to war will not produce lasting peace and security. Among positive examples, Mr. Feltman commended the recent completion of the National Dialogue in Yemen which was part of the country’s political transition agreement. He noted that reconciliation cannot substitute for justice, but that the reverse is also true, as examples from the former Yugoslavia and Rwanda show that international tribunals cannot substitute for national reconciliation. 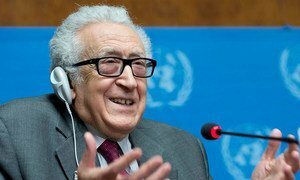 Discussions on humanitarian issues at the Syria talks in Geneva “have not produced much,” said the Joint Special Representative of the United Nations and the League of Arab States today, but he added “there is still hope,” and the talks will resume tomorrow.